What can I say...I just saw "Rock of Ages" and have hair metal on the brain! Thank you all so much for your well-wishes and advice regarding my horrendous case of poison ivy! I've been doing almost nothing but fighting with it for the last few months, and have actually contracted it twice more, though not as severely, thank goodness! In addition, despite our research and safety precautions, two family members who came to help me have also gotten mild cases; this stuff is virulent, but I'm determined to beat it! I've also been following my healthier eating plan and trying to walk every day, and I've lost five of my holiday pounds; three more to go! Woo hoo! In the meantime, I made this jumper utilizing another friend to the fluctuating waistline (or hip-line, as the case may be! ): the bias cut. Cutting a garment on the bias allows the fabric to flow fluidly across the lines of the body while also allowing for some stretch. Bias-cut dresses were immensely popular in the 1930s. 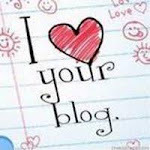 Here are some beautiful images, which I borrowed from here. I did make a few changes, but only to the shirt: I moved the buttons from the back to the front, and I shortened the sleeves slightly. The navy and cream crochet gloves were a recent gift from my mother. 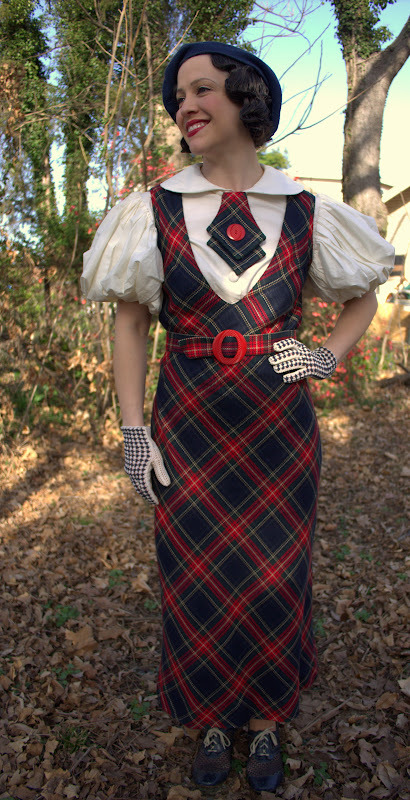 The matching buckle and button are vintage; I love the subtle plaid print impressed on them. 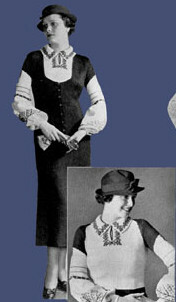 Jumpers were also a staple of 1930s fashions. This post from Baroness Von Vintage has some lovely images of jumper patterns, along with a link to a very cute one sewn by SuperHeidi. Below are some patterns from my own collection, at least a few of which I hope to make up someday! 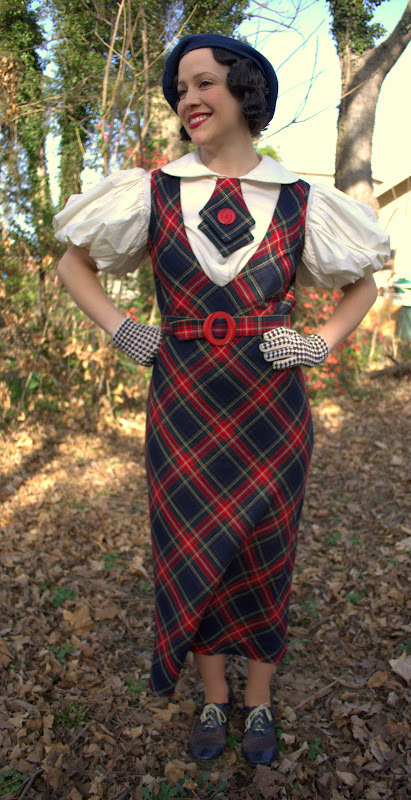 The jabot came to be after I attempted to make a tie while following the print of the plaid. It turned out to be much too large; the ends overlapped the neckline of the jumper, which made the entire outfit look messy to me. So I chopped off the ends, made a loop at the top, and ran a grosgrain ribbon through the loop. The button is purely decorative. See all of that stretch? I'm thinking that I can skip my walk tomorrow....thank you, bias-cut dresses! Once again, I've neglected this blog for far too long; however, unlike in times past, I have a very valid reason this time: I've been suffering through the worst case of poison ivy imaginable! At least, I never imagined it would be this bad. As soon as the weather permitted, I began working in my backyard, thinking that this would be the year that I would finally get it under control. Though beautiful, my yard is very overgrown. I've never had poison ivy before and was not looking for it, but it certainly found me! I'm not one to go to the doctor or take any kind of medicine if I can help it, so at first, I decided to just tough it out, wear pants and long sleeves, and let it run its course. That was until it spread to my face. On my birthday. According to the doctor, I had a "very severe reaction". You know it's bad when you walk into the office and hear a collective gasp from everyone in the waiting room...even a man wearing a mask scooted away from me! Now, over three weeks, a shot, an oral steroid, and all manner of topical creams later, I'm still miserable and embarrassed to leave the house. So, while I am definitely not photographable right now, my little one certainly is, so here you go! 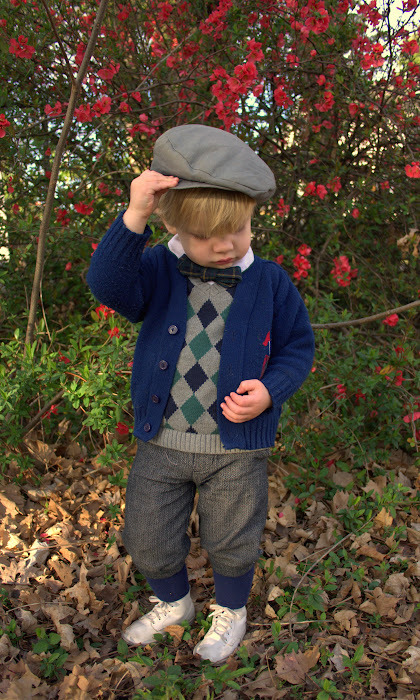 I made his knickers (or knicker-pants, as he calls them) with some herringbone wool from my stash. The bow tie was made from a scrap left over from a plaid vest that I made for my husband some time ago. I'd been wanting to make a bow tie for Henry but wasn't really sure how (or how to tie it). I found these wonderful instructions from Le Noeud Papillon, and discovered that a bow tie can be as simple as a straight strip of fabric, rather than the butterfly shape that I thought they all were. I tested the length and width with a ribbon, and then made it just like I would make a belt. More pockets! Isn't he just the little gentleman? 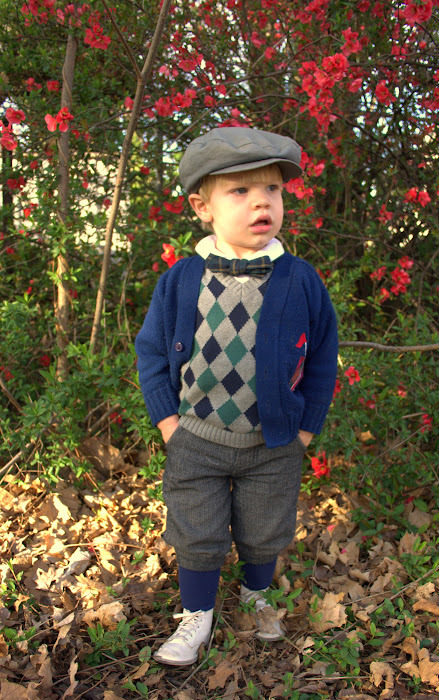 The rest of the outfit, including the sweater vest and cardigan, were found at a resale shop. 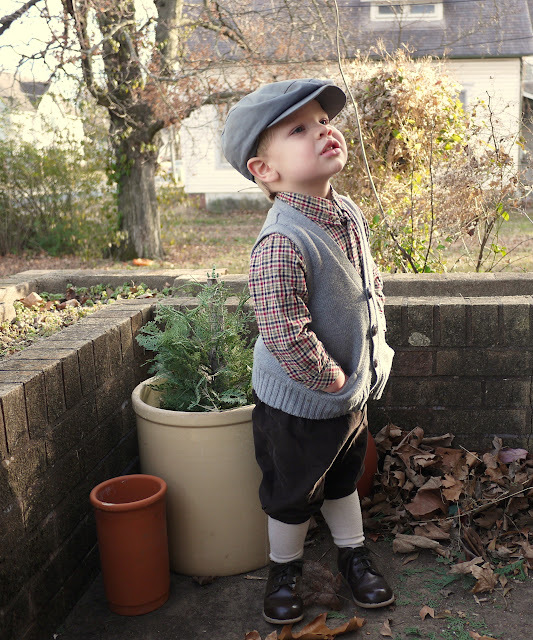 This is one of my favorite outfits to put him in, and I'm sure you can see why my family cannot resist calling him "Bagger Vance" whenever he wears it! Also, I wanted to thank you for your votes in the EvaDress contest; I won! I'm so excited and honored to have won this year, and I can't wait to start on those beautiful new patterns! Thank you for all of your lovely comments on my last post as well; please forgive me for taking so long, but I did go back and try to respond to those of you who had questions for me. I've gotten a few more projects completed, which I will be sharing in the near future (as soon as I no longer look like a leper)! 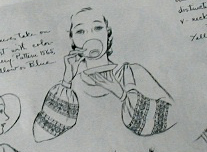 The first was made from this beautiful evening dress pattern. 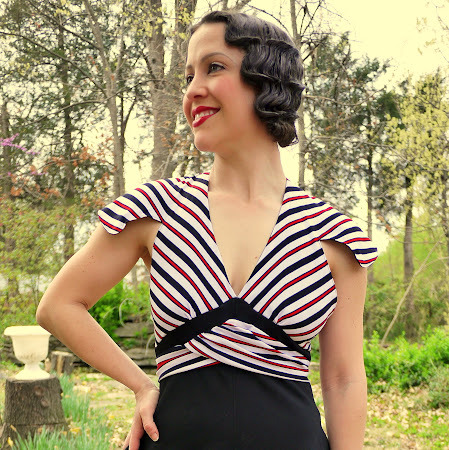 The bodice is made with a striped rayon fabric, which I love; I made a skirt with it a few years ago, and I still have about four yards waiting for the perfect pattern. I lined it with a sheer black material so as not to weigh it down. When I first saw the pattern piece for the bodice, I thought, "Hmm; where's the rest of it?!" It has a little less fabric on the top than I'm accustomed to, but it's so beautiful! The skirt is also rayon, and cut on the bias, which allowed me to eliminate a zipper. Hooray! I think the back is the best part. I found this vintage buckle that matched perfectly. I'm hoping to wear it to a wedding in August. I love this pattern, and I'd really like to make a shortened version for a summer daytime dress. My second entry is this blouse. I found this beautiful herringbone wool on sale, and decided to use it to make up this pattern. Don't you love the sleeves?! I had to grade it down to my size, which was a little challenging. It's hard to tell from the photos, but I made the herringbone pattern run vertically on the sleeves and lower bodice, and horizontally on the upper bodice and belt. It's much more noticeable in person. I made the skirt and gloves last summer and never got to share them; I'll show some more of them later. Another unseasonably warm day! Although I had so many fall and winter projects planned that didn't come to fruition, I must say that I am ready for spring! 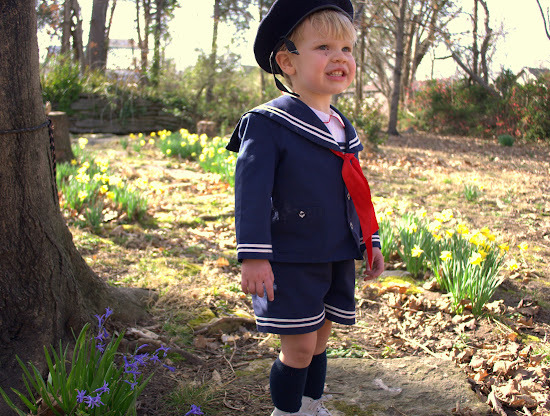 Here is Henry's outfit for Easter (if he doesn't outgrow it before then)! 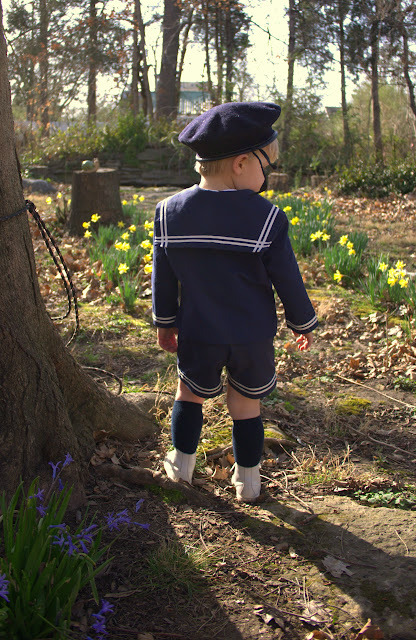 He had a store-bought sailor suit just like this one last year, and I loved it so much that I decided to make another one just like it for this year, using the old one as a pattern. It's made from a navy cotton blend fabric. 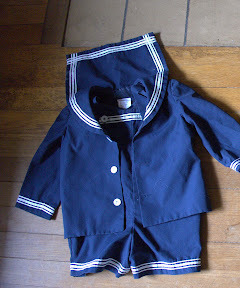 It was one of the rare times when I bought a fabric that wasn't on sale, but that's the beauty of these tiny outfits: they don't require very much fabric! Here is a picture of the old one; I took this photo before I hacked it to pieces. Just kidding! I just took apart all of the seams and used the pieces to make a pattern, adding a few inches to make it larger. It was actually easier than I expected it to be; easier even than working with an actual pattern, because I could see exactly how it all went together. My trim is a little bit simpler, and I added pockets in the front, because he is currently obsessed with them and now refuses to wear anything without pockets. The old one was also polyester. Aside from these small alterations, I really just copied the original. I used some anchor buttons, which I thought were cute, but now I'm thinking that they look less vintage than the pearl buttons on the original. What do you think? 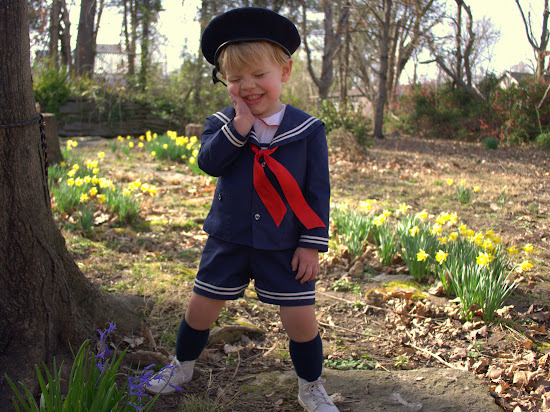 I found the wool sailor's cap at a thrift store at the beginning of winter, and the shirt came from a resale shop. The sash is just a satin ribbon. Those cute little white shoes are vintage from ebay. I love them so much...if only he would stop growing! Sorry about the blurry pictures; it's difficult for a two year-old to stand still for long! I also took some pictures of my newest completed outfit, which I'll be sharing soon! 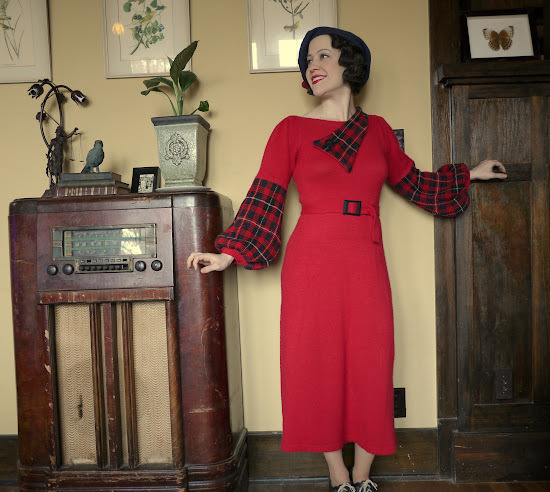 Altered Knits: Mad About Plaid Part Deux! I made this dress for the Burns Supper that I hosted a few weeks ago, but I couldn't get a good picture of it until now. My sister and I have hosted a Burns Supper for the past few years. I always ask everyone to wear plaid, although we don't have a completely traditional supper. I am a vegetarian, so we don't have haggis; we still do the "Address to a Haggis", though, if only so we can stab something. My sister and I are the only ones who are really serious about it, and the rest of the family just sort of humors us, so we have to keep them entertained! We do make everyone recite one poem, and sometimes we make up little tunes for them and have my cousin accompany on guitar. Pretty entertaining. Then we watch "So I Married An Axe Murderer"; you know, because Mike Myers plays a Scottish character who eats haggis. Robert Burns would probably roll over in his grave, but we have a good time! Please forgive the funny pose; I was trying to ensure that the sleeves showed. I had to take these pictures myself using the timer on the camera, so if it looks as if I was jumping into position, it's because I was. I also cut off my feet; apparently the Lincoln Log tubs on which the camera was sitting weren't stacked quite right...The light inside my house is terrible, but it will have to do until Spring arrives! At least I'll get to show a little bit of my house, which never seems clean enough to photograph. I knew that I wanted to do something to alter the sleeves, but my options were limited by the size and shape of the available vest material. 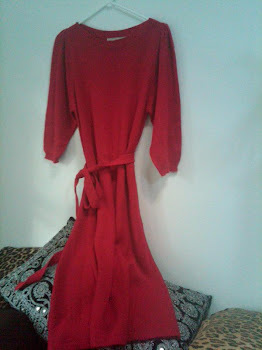 In looking for inspiration, I spotted a lot of bell-sleeved dresses and sweaters with contrasting lower sleeves. Ever since I saw this picture, I've been hunting for enough black fur to make this coat; I have some red wool that would be perfect! I think the orange striped one is actually a jacket over a bell-sleeved blouse. I was afraid that using a different print for the lower sleeves would make them look too much like they were altered; like they were just stuck on the ends of the existing sleeves (which they were!) instead of appearing as if they were knitted all in one piece. I found quite a few examples, though, that were knitted that way, including these beautiful full-color ones! This one looks like a knitted jumper over a coordinating sweater. Lovely! I started by removing the sleeves in order to move the shoulders up and take in the sides. The sleeves were originally gathered at the shoulder, but I wanted the shoulders to lie flat for a smoother line down to the bell, so I put in a series of radiating darts. The sleeves were three-quarter length, so I cut off about six inches so I could add the bottom part. I reattached the sleeve band to the bottom, which I had gathered. I was very proud of the way these turned out; I had to do a lot of measuring (which is not my forte) and drafting, and they ended up exactly as I had planned, which is rare for me! Luckily, it came with a tie belt, so I just cut it down and put a buckle on it. I used the extra red material from the sleeves to back the collar and the insert for my hat. 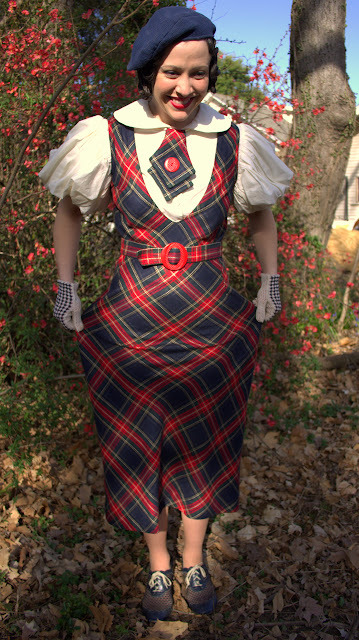 The plaid collar comes from behind the shoulder and is stitched in place with a big vintage button. This dress took me about three days to make, most of which was spent planning, measuring, and drafting the sleeves, and then procrastinating because I was afraid that my measurements were wrong. That's pretty much my M.O. on every project, although I have managed to get another sweater dress finished; I'll get some pictures of it if we ever see the sun again! Hello, everyone! I apologize for the lack of outfit posts recently; the truth is that I gained eight pounds over the holidays (I told you they hit me hard)! That may not sound like much, but when you're five feet tall, it's enough to render all of your clothes too small. Especially when it all goes to your hips (Thanks, Mom)! Growing out of your clothes is always very unpleasant, but I think that when you sew your own clothes, when you invest your time and love into each garment, it is especially hard. Perhaps it was the fact that I was in charge of Christmas dinner this year; of course, I had to test (eat) all of the recipes before I served them! Or it could have been the dozens of cookies that my mother-in-law baked and then left at my house; I mean, I couldn't let them go to waste...Anyway, since I will be working hard to shed those extra pounds, I haven't been too keen on sewing anything that might not fit in a month or two. My solution: knits! If you've been following my blog for a while, you'll know that altering knits is already one of my favorite things to do. They're stretchy, so they will still fit me after I (hopefully) lose a few inches, and it's the perfect time of year for them. Since I currently have almost nothing to wear, and since my husband gave me a serger for Christmas this year (so exciting! 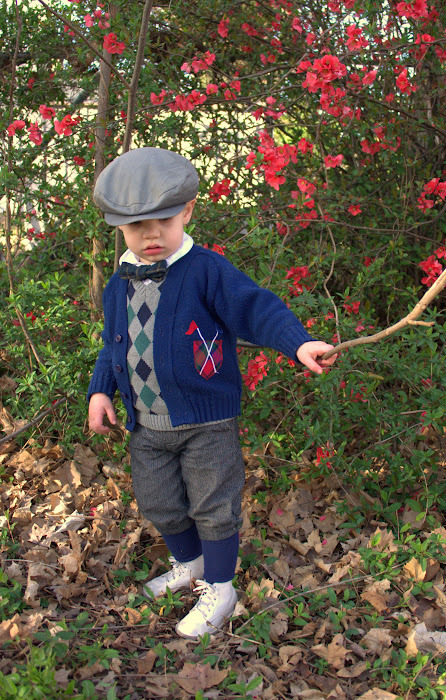 ), I've been furiously working on some '30s-style knits. Here are some pictures that have been inspiring me. All of these photos come from reproduction knitting books available at Iva Rose Vintage Reproductions. I could look at the pictures on her site for hours; so much inspiration! 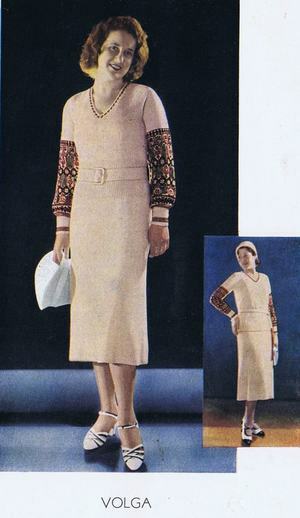 A knitted pantsuit! I don't think that I could pull this off. 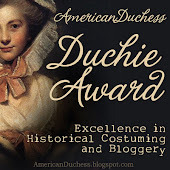 If you want to see that amazing dress on the lower right in person, check out this post from A Cat Among the Pigeons. Beautiful! Knickers! I think that, traditionally, Henry is really too young to be in knickers. It seems that in most of the old pictures I've seen, boys his age are in shorts year-round, and the boys wearing knickers are older. I just can't put him in shorts in the middle of winter! And the knickers are so cute. If only I could find those socks! These are the same shoes and knickers that he was wearing in the last post. The shoe paint has held up pretty well; however, there was an incident when he tried to jump into a swimming pool (indoor!) fully clothed. The paint sort of sloughed right off. I'm not sure if it was the water, the chlorine, or something else, but just keep that in mind if you plan to try this technique. The hat is vintage; I found it in a flea market last summer, and he has been wearing it nonstop ever since. 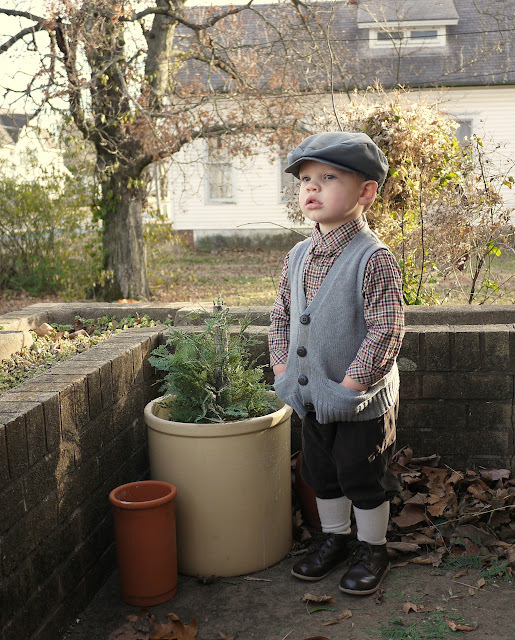 I made the shirt a while ago, and the vest is from Carter's. He is obsessed with pockets right now, so I have just finished another pair of knickers for him, with pockets this time. Looking at these pictures, I decided that he needs some little ties! I finished my evening dress, and it was a hit at the wedding, as was Henry's outfit. We just got a new camera, so as soon as we figure out how to use it, I will share pictures!